Today is a wonderful day the block. 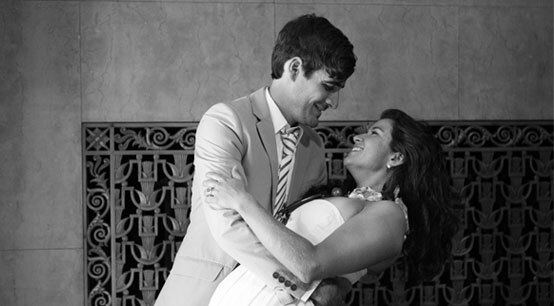 Leo, one of our own, got himself hitched and we couldn’t be more thrilled. So you can imagine my excitement when I came across this on etsy. This adorable painting clocks in at a miniscule 2½” × 3½” but it is really quite beautiful even at such a small size. It’s actually a digital illustration printed on stretched canvas and it comes on it’s own tiny easel (apparently affixed by elves) as well. 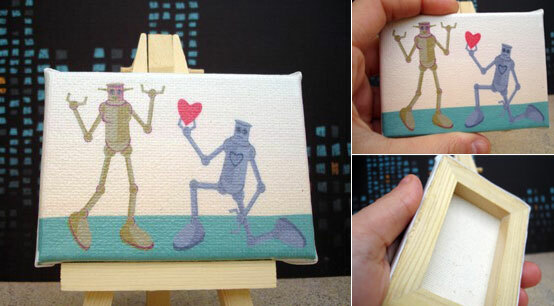 I love the idea of robots in love, it seems to have a greater meta implication that maybe we are all robots…in love. Grab yours at ArtIsBetterTiny’s store on Etsy for only $12! Also, thats a really nice tie. I am so glad Leo got married that I went and got married myself. 8 years ago.